The world of augmented reality (AR) and virtual reality (VR) is pretty new, but fortunately, the legal standards for these experiences are still very similar to the legal standards for video games and experiences in other more common media types. The same goes for managing events focusing on VR/AR experiences and mitigating risk. For the developers and designers of VR/AR experiences, one of the biggest concerns continues to be preventing virtual reality sickness with your experience. VR sickness is what happens when you’re exposed to a VR environment and it causes symptoms similar to motion sickness. However, it’s different from motion sickness because real motion isn’t needed – it’s caused just by feeling like you’re moving. VR sickness is also different from what’s been called simulator sickness as simulator sickness is what pilots get in flight simulators and can be more intense than just the disorienting feelings from VR. 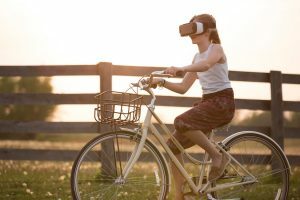 One great tip for mitigating risk at a VR event: do not allow the participants to play VR while riding bikes. The slower and more predictable the camera is, the less sick people will feel. And there have been a few good tricks generated along the way. Putting a user in a static environment, like putting them in a cabin or a capsule or a cockpit, helps people feel more stationary. Teleportation is also a locomotion concept that helps get rid of movement visualization which can help reduce motion sickness. Not creating a full visual of the body also helps with perception and disorientation – developers not visualizing or animating parts of the body that can’t be tracked helps reduce cognitive dissonance. If running an event and aiming to mitigate risk, the primary thing developers and those showcasing VR experiences need to remember is to have a waiver for participants to sign. This is frequently ignored, and it shouldn’t be. It is also essential to get liability insurance – especially if offering a permanent location for VR or AR events. When getting insurance, businesses should review their policies to ensure that their VR/AR activities are actually covered and there is no coverage exemption that the insurance carrier could later use to avoid pyaing any claims. In a waiver, there should be similar clauses covering you that would apply to a batting cage or a gym. Participants should specifically acknowledge that participation in a VR arcade or event could lead to injury or death. However, the waiver should also not be too narrow. This can be tricky: a good waiver has to be specific enough that a participant is clearly informed of risks, without being drafted in a way that would lead them to conclude the specific risks listed are the only risks. All of this needs to be done using language that is clear and avoids confusing legalese. A good waiver should also include a “severability clause.” This is a contractual provision that allows a court to enforce parts of an agreement even if the other parts are not legally enforceable. Say a waiver includes express waivers of A, B and C. Later, a lawsuit claims A and B. The court determines that the waiver, for one reason or another, is ineffective with respect to Claim B. Without a severability provision, there will be an argument that the claims for both A and B can move forward. A severability clause keeps the waiver in place for Claim A, which could mean big changes to litigation strategy or settlement values. That being said, if someone dies in your VR arcade, you will most likely still be sued. A waiver won’t stop that. A waiver provides a defense to liability, but it won’t stop the lawsuit in the first place. Additionally, some things cannot be waived away. For example, if a customer gets hurt because of a hole in the floor, that’s probably going to be the proprietor’s fault. The moral of this story is that you need insurance and your insurance broker needs to understand what you’re doing. People in a VR arcade or at an event highlighting VR or AR games aren’t just sitting and playing games. When it comes to the contracts you need in place for your VR/AR experience, check out this blog post for an introductory primer.